Today would have been my seventh wedding anniversary. Instead, it’s the second anniversary marking that our lives no longer one. In many ways, I’ve already given today its due during the eighteen days I was recently in Montreat. He and I worked together on Montreat Summer Staff as college students. He proposed at a dear friend’s Montreat house. We were married on the porch of Assembly Inn on a perfect August day. That August 3rd was filled with people, love, and all things delightful about that beautiful mountain valley. Sunset over the mountains of Asheville was the backdrop for the reception, and there was much laughter, sangria, fresh mountain trout, and key lime pound cake. During my recent time in Montreat, I found myself expecting to turn a corner and see my mama, because I am still not used to being in Montreat without her. I’ve known it to include her my whole life, and over two years after her death, I still expect her to be sitting in a rocking chair at the Left Bank, or walking across Lake Susan dam, or coming to the Auditorium offering to go run errands for conference leadership. I still have her as a “favorite” in my phone, and I found myself about to text her one afternoon to see if she would pick up my contacts from the local eye doctor. Grief is bizarre like that. I’m not in denial that she’s gone, but some days my subconscious forgets. I had lunch on Assembly Inn porch one day, and had the pleasure of hearing my friend Josh tell me all about his recent Montreat wedding. Then Heather filled us in on plans for her upcoming Montreat wedding weekend. As we sat in about the same spot where I stood seven years ago, it felt right. I loved hearing about their lives full of love, and I love that we all share such great unity in that mountain valley that holds so much of our pasts. I found myself thinking of all the conversations the three of us have had in that valley, not all have been so joyful, yet the mountains hold them all. There is strength in those mountains, and such a gift in friendships that pick up right where we left off in kairos time. The day before one of the keynotes where I shared the story of my mom’s death, I went walking to the creek alone. I needed introvert/only child time, and I also needed to feel her presence and listen for her voice. Those waters and those rocks hold many conversations with her, and I find strength there. 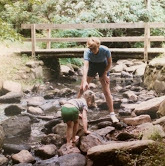 I remembered all the years we spent “rock-hopping” in the creek, and all the milestones, rites of passage, and life lessons that happened in between summers spent in those waters. I watched as kids splashed and slipped on the rocks, and adults held out a hand and encouraged them to try again. I’m grateful to the Montreat valley for taking such good care of my memories-the perfect ones and the painful ones. I’m so glad the mountains know everything that has taken me a while to articulate. My marriage, like that beautiful August day, wasn’t all bad and painful, and it wouldn’t do the love justice to say otherwise. I still slip and splash around in the rocky terrain of navigating life after betrayal, and am glad for the folks who reach out their hands and encourage me to try again. Mostly, I’m grateful for the eighteen days in that sacred valley of identity to process, cultivate, heal, and remember. On some of the rocks are timeless raindrops. Under the rocks are the words. And some of the words are theirs. I am haunted by waters. Love you and your beautiful words that reveal the depth of your wonderful heart. Peace be with you today, tomorrow and all the tomorrows to come. Your words are beautifully remembered and articulated and filled with Hope! Praise God. Beautiful words about one of my “Thin Places.” Thank you for sharing them. I so remember your mother and I sitting a the back of AA and having so much fun talking together. I so miss those times.